Let’s see, where do I begin? I’ve been brewing a colony of bacteria and yeast, fed by pure white sugar, which looks like a placenta, on my kitchen counter for weeks. All for the purpose of drinking the resulting liquid. There it is. The simple truth. If you are a little turned off by the whole idea, you’re not alone! In fact, my entire family thought I’d completely lost it. That is until they tried this amazing drink and learned of its amazing health benefits. So, don’t stop, continue to read. I promise, it gets better. 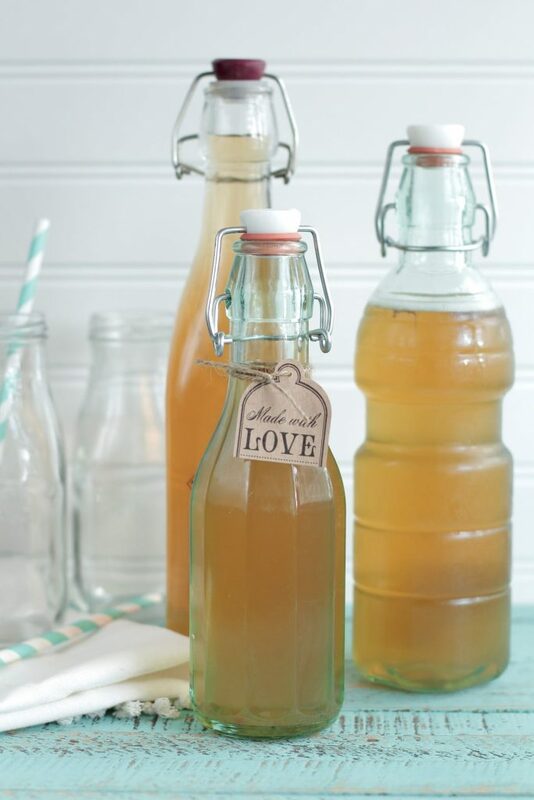 Kombucha is a naturally carbonated sweet, fermented tea which contains probiotic benefits. Kombucha is produced by using tea, water, sugar (plain ol’ white organic sugar), and a giant “mushroom” (I think it looks more like a placenta) called a “SCOBY.” The sugar feeds the SCOBY (Symbiotic Colony of Bacteria and Yeast) which ferments into a delicious, nourishing tea. I know that sounds even scarier. A giant mushroom placenta that eats sugar. Just keep reading. After the SCOBY has done its job, a simple mixture of tea and sugar is turned into a naturally carbonated drink filled with naturally occurring health benefits. Kombucha is a traditional drink enjoyed first by the Chinese and later spread to Russia, Japan, and Korea. Kombucha is enjoyed for its unique taste (a wonderful way to replace sodas and juice) as well as its many health benefits. One of its greatest health benefits is detoxing the body. It’s also rich in glucaric acid and amino-acids which can help prevent (and possibly) treat cancers. Kombucha boosts the immune system as is anti-oxidant rich. This wonder drink is also a mom’s best friend as it gives energy. What mom couldn’t use an energy boost? Sleep deprivation is a real thing, folks. Come over for a night. Remember, that colony of bacteria and yeast? All that goodness is part of the amazing health benefits of Kombucha. We need good bacteria to maintain a healthy gut. The good bacteria makes Kombucha the perfect probiotic which helps restore good gut flora in your system and fight off the bad yeast (candida). You can read more about the health benefits of Kombucha here. Kombucha is enjoyed for its unique taste (a wonderful way to replace sodas and juice) as well as its many health benefits. 1 scoby you also may be surprised to find a fellow Kombucha-brewer willing to share the love. Bring 12 cups, 3 quarts, of water to a boil. Add in 1 cup of sugar and stir until the sugar is dissolved. Add in 5 tea bags. Allow the tea to steep for about 5 minutes and remove the bags. Allow the tea to completely cool. Once cooled, pour the sweet tea mixture in a gallon-size jar. Place your SCOBY inside the jar with 1/2- 1 cup Kombucha. Cover the jar with a cheesecloth and rubber-band. Store in a warm, dark place for at least 6 days up to 28-30 days. The longer your SCOBY and tea ferment the less sweet and more sour the tea will taste. Remove the SCOBY and any babies from the Kombucha and reserve 1 cup of Kombucha liquid with the SCOBY in a bowl. Strain the Kombucha through a mess strainer to remove any loose pieces. This is optional. If you don’t mind drinking the pieces, you’re welcome to skip this part of the process. Now, it’s time to add flavor. I chose to flavor mine with strawberries. I used 3 diced strawberries per bottle of Kombucha. In a another bottle, I added 1 cup of mango juice. Be creative, the possibilities are endless. Pour the Kombucha in each bottle. A funnel is a handy tool for pouring. You don’t want to waste any of that precious Kombucha. Seal your bottles and leave the Kombucha on the counter for two more days. This is called the second ferment. 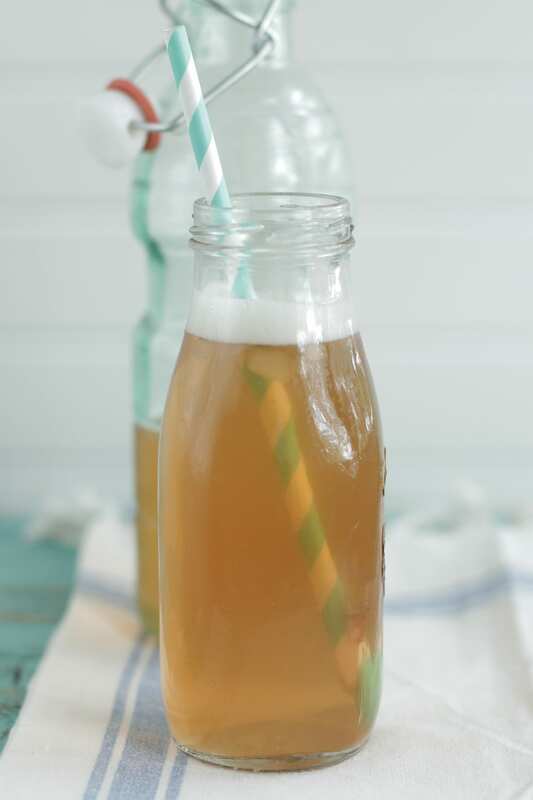 During this time the tea and flavor will infuse together creating a delicious, fizzy beverage. After two days, you can refrigerate your tea and start drinking. I ferment my tea for seven days. The SCOBY will grow a baby (I told you this was like a placenta.) A new SCOBY (a thick film) will also grow over the top of your Kombucha and the original SCOBY, “the mother”. Real Food RN has great suggestions for flavoring your Kombucha. You can also check out Cultures for Health’s suggestions. You can find my recipe for Berry Lemonade Kombucha here. Yes, a tad bit unusual, but once you start drinking Kombucha you’ll forget you ever handled a placenta-looking “mushroom”. The final result is a tea that’s delicious and full of health-giving benefits. Olive kombacha and have been making it for a while. I think I forgot the sugar this last time. Will that hurt my mother. :/ ? Do you have a favorite flavor? I am still experimenting, but so far love the berry combo! 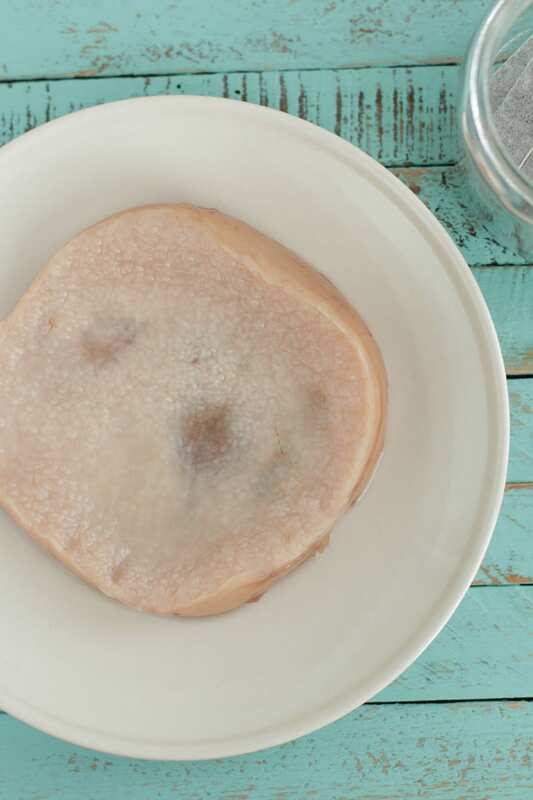 A SCOBY really needs sugar in order to thrive. If you begin to spot any mold growth I’d toss it. Can you start a new batch with the SCOBY using sugar? Thanks. Can’t wait to hear about your Kombucha! I am still on the fence about Kombucha. Have you read this? http://www.orawellness.com/blog/why-we-dont-drink-kombucha/ What is your take? Now this is interesting. So just use organic tea? You have peaked my interest. Do you have to use white sugar? Can you use honey? Organic tea is best. I’m not sure about honey, however, I do know the SCOBY feeds off the sugar (literally it’s food) so it really is one of the keys. Without sugar the SCOBY dies. The SCOBY eats nearly all the sugar, so there is very little remaining in the Kombucha. I’d be interested in what you find out about using the honey. I’ve heard that using anything other than straight white sugar really weakens the scoby. Honey, as one example, can kill the scoby because it has so many anti-bacterial and anti-microbial benefits. The scoby survives and thrives on straight sugar. And it transforms the sugar, so it’s not like you’re digesting it straight (something that I also worried about upon hearing about kombucha. I don’t like eating a lot of sugar in my diet and I definitely don’t like giving my kids a ton of sugar). Most of the sugar is “eaten” by the scoby and transformed into healthy flora and enzymes, which are super beneficial for you and your gut. Thank you so much for sharing, Bekah! Great tips! Water kefir gives me that energy boost, too! Love it! A friend gave me a scoby starter this past weekend and I’d like to give this a shot. I don’t have any white sugar in the house, but I do have an old bottle of agave that’s collecting dust in my pantry. Do you think that will work instead of the sugar or should I just go buy some sugar? That’s great! I would buy some sugar. If you are planning on making it regularly you will need it on hand too. I didn’t have any sugar in the house either, so for the first time in a long time, I had to go out and buy some. The SCOBY feeds off the sugar, not sure how it would do with Agave. Where do you get a SCOBY?? You can purchase one through Cultures for Health (http://www.culturesforhealth.com/starter-cultures/kombucha.html), amazon, or ask around at a local health food store or even craigslist. Is there a place to get the bottles? Shipping from AMazon is astronomical. This is the ONLY reason I haven’t attempted this yet. Thanks for the excellent tutorial! I’ll be referring back to this! Thank you so much for posting this! I was able to buy a GTs Original on sale for $1.99, and over the coarse of two weeks it grew a beautiful Scoby about a quarter of an inch thick. Amazing, I love home science! How do you store the SCOBY in between making batches of kombucha? I keep my SCOBY in 1 cup of Kombucha in the fridge while I am not using it. Do you keep in covered in Tupperware or open in a bowl? Hi Jayne, I keep my Kombucha, during brewing, covered with a cheesecloth or breathable towel and rubber-band. Fruit flies tend to love kombucha and can quickly invade if left uncovered. The Kombucha needs to breathe, so it’s best not to use a tight-fitting top. You really shouldn’t keep your SCOBY in the fridge. Check out kombuchakamp.com. Hey Lisa, Thanks so much for the suggestion! In Florida, we’ve had really bad issues with the SCOBY sitting out, even in an enclosed SCOBY hotel. Enjoy the kombucha! Do you share the Kombucha with your kids? I recently read it can contain alcohol because of the fermenting process. I was concerned as this is all new to me. I wait till they are a year old and then I give them about 1/4 cup of kombucha daily. It’s more a medicinal drink than a drinking beverage. There is a minute amount of alcohol particularly the longer you let it ferment. I do 6-7 days and so I don’t need to worry about it. Thank you for the info Kristin! Kristin – what do you do with the SCOBY if you are going to be away, or unable to make Kombucha for awhile? 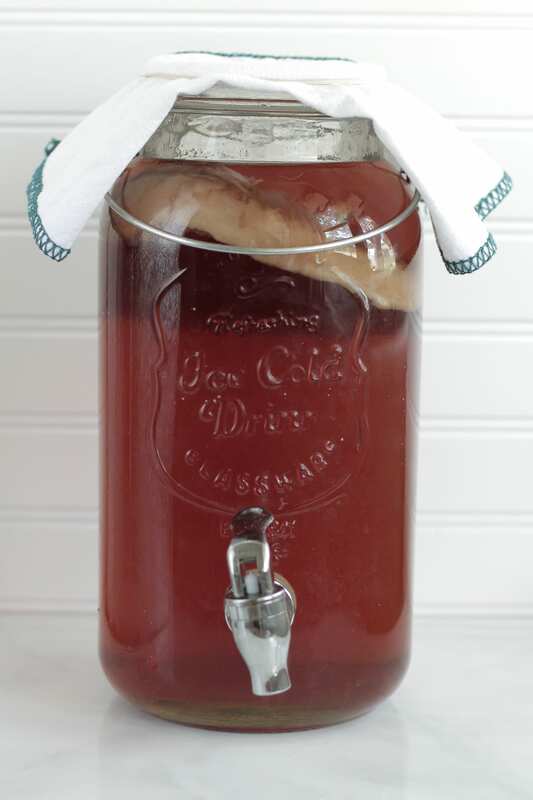 If you’re going away or don’t plan to make Kombucha for a time, I recommend keeping the SCOBY in a SCOBY hotel, just a storage container with Kombucha, kept in a dark place. I’m just starting out, and I don’t know anyone who does this. Where do I get the 1/2 to 1 cup Kombucha (you will need at least 1/2 cup of already fermented Kombucha)? Any suggestions?? Hi Michelle, You can generally find bottles of already prepared Kombucha at any health food store. You can use 1/2-1 cup of this liquid as your starter Kombucha. Thank you Kristin. 😀 We only have one health food store in the area. If they don’t carry it do you know where I may be able to purchase online? Hey Michelle, I think the health food store will probably carry a brand, but if they don’t I’d try Vitacost or Amazon. Hey Penny, The already prepared kombucha comes in both flavored and non-flavored options, and is found in the refrigerated section at the store. I believe store-bought prepared kombucha and kombucha drinks are the same thing, but I could be wrong. To make a flavored version, similar to the famous ones at the store, you’ll need to add flavor to the second ferment. I am so excited to start this process and a friend shared with me a scoby start and her kombucha. You are so inspiring and your instruction is such a blessing! Thank you! 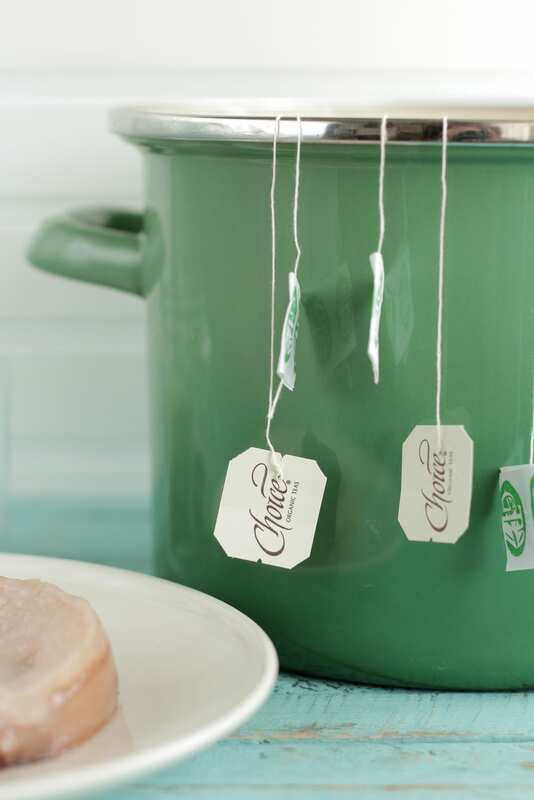 Can you use flavored tea bags to impart flavor to the kombucha? Hey Emily, Yay for great friends that share Kombucha and SCOBYs! I haven’t used flavored tea bags for making Kombucha. I’d recommend not using any herbal teas as they may kill the SCOBY. So glad you found the tutorial helpful. Let me know how it goes and if you have any questions. Just made our first batch tonight! I’ll let you know in a week. Thanks Kristin! So glad you got a SCOBY :). Let me know how it goes. I LOVE kombucha and LOVE making it. But I seem to have a problem with it growing mold. It has started to mold as early as the 6th day. The starter pack (includes SCOBY, sugar and tea) that I get from our local co-op doesn’t say to add the ½-1 cup of pre made kombucha to it. Could that be part of the problem? I live in WA, so I don’t think weather is an issue. HELP! Hey Ericka, It sounds like you are doing correct to make kombucha. I’m not sure what would be causing the mold growth. Do you allow the tea to breathe with just a light towel or cheesecloth over the jar, during fermentation? A lack of air can cause mold growth. Had good success with this post. I have one question though. When seperating the mother SCOBY and babies after the batches what one would you keep in a SCOBY “hotel” as a spare incase of mold ect? Hi Karla, I usually place the SCOBY “baby” in the hotel and continue to use the “mother” for making Kombucha. How many times can you reuse the “mother” and how long can you store the “babies” in the hotel? Hey Lindsay, You can reuse the “mother” forever. The babies will last a very long time (years even) in the hotel until you share or use them. You recipe seems to be the easiest I’ve found. A friend of my husband gave me a Scoby and a starter batch. Can’t wait to try my hand at making my own. I wish this recipe had an easy “print recipe” button like some of you other posts. 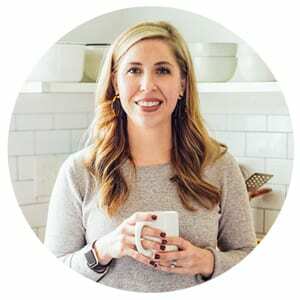 Hey Lori, We are currently working on switching over our recipe “cards” (the little recipe sections with a printer-friendly option) because the former company service we used went out of business in December. So, I’ll add this post to the list. Thank you for the great suggestion! Enjoy the kombucha! While cutting and pasting this recipe to a word document I can print, I noticed step 4 is missing. It looks like all the recipe is there, so maybe it’s just a numbering error? Thank you, Lori. We recently went through some technical changes, so this is very helpful! I’ll take a look and change it. The instructions say “(you will need at least 1/2 cup of already fermented Kombucha)”. Should I use store bought kombucha? Hey Vina, Yes, you can use the plain kombucha from the store for the 1/2 cup of kombucha starter. I recently received a scoby from a friend and have attempted to make kombucha for the first time. It has been sitting on my counter for 9 days now but is still not fizzy. Am I doing something wrong or could the scoby be bad? Hey Kim, The real fizz will come from the second ferment. As long as the SCOBY isn’t moldy, your SCOBY and kombucha should be great. I have never made Kombucha but want to so I have been reading up on it. One thing I haven’t seen mentioned or maybe I missed it is whether or not you must feed the stored babies and do you store them separately. Also do you store them sealed or with a cheese cloth covering. Hey Marjorie, You’ll need to keep the babies in a “hotel” environment. Basically, a container with kombucha, so they can stay hydrated for future use–enough kombucha to fully cover the SCOBYs. You can set up a hotel with as little as one SCOBY or multiple. I usually seal my baby SCOBY because I turn right back around a few days later and use it to make more kombucha, but if you’re storing multiple SCOBYs long-term, place a cheesecloth or coffee filter with a rubberband over the top of the jar. I just visited a neighbor who’s going to give me a SCOBY to get started. Your site is very helpful, too. One question: does it matter if the tea is caffeinated or not? Hey Abby, That’s awesome! You can use decaf or caffeinated, just not an herbal tea. Hey! Awesome article, thanks a bunch. The glass jar featured in the photographs, the one with the spigot––where did you purchase that? I’ve been experimenting with making kombucha for a bit now, and I’ve decided I want to get into a continuous brew method, but I’m having a tough time finding a good spigot-ed container! Hey Sierra, You’re welcome :). I purchased my container from Target. When you flavor with frozen fruit do you thaw it first? Hey Charlene, I just toss the frozen fruit in the bottle directly from the freezer :). Hi Kristin, Thank you so much for the information. Would using organic Cain suger be ok? Awesome Q & A on here also. Hey Brian, You’re welcome. Yes, organic cane sugar will work great! I am eager to experience the benefits of Kombucha, but I don’t want to drink tea. I have heard one could use Rooibos herbal tea to brew it (supposedly the only herbal that would work) but to brew it with Black or green tea now and then to make sure the SCOBY is well fed. Do you have any suggestions please? Hey Bethany, I’m not sure about Rooibos. I’ve always stuck to green or black tea. I found this blog where the author shared her experience: https://nourishingmylife.wordpress.com/2013/04/20/rooibos-kombucha/. Here’s another article: http://www.kombuchabrooklyn.com/blog/caffeine_and_kombucha_1/. Thanks so much Kristin! I am brewing my first batch of Rooibos Kombucha now with my GTs home grown SCOBY. Maybe it’s just me but that white slimy wafer seems to put off a happy vibe. 🙂 Its an awesome feeling. Lol, I agree! I can’t wait to hear about your finished kombucha. Awesome job!! Hello, I love this article and I am looking to try this but I ha e a few questions. I know someone else had mentioned storing the SCOBY in between batches, but do they need to be covered? I saw on Amazon when you buy it they come in a sealed plastic bag. Can you just put som Kombucha in a zip lock back with the SCOBY and store it in the refrigerator? Or a Tupperware container? And for the “hotel” for the babies, you said to cover them with cheesecloth or a light towel, but if you store it for a period of time wouldn’t the liquid evaporate? Do you need to add more? I have been using just Lipton black tea but can I switch that to organic black/Green tea or will that affect my scoby? I had also been using sugar in the raw. Is that ok or does it need a more refined sugar? Hey Christine, From my experience, switching from a “regular” black tea to an organic black/green tea should be just fine. Also, the sugar in the raw is perfect. Happy New Year! Can I keep my fermenting kombucha in actual “real” Tupperware with the cheesecloth instead of seal on top or does it have to be in glass? I also heard you shouldn’t refrigerate your kombucha scoby. True? Thank you! Hi! Thanks for this post. I found a local scoby and have made a couple of batches now, each one better than the last. I’ve been leaving my baby scobys in. Any harm in that? My mama scoby looks…. brown? Much darker than the growth on the top. Does this one get old/need to be replaced with a baby from time to time? From my experience, the additional SCOBY babies won’t hurt the kombucha, so you can leave them in there. The mama SCOBY will begin to look very brown and almost like it has veins after multiple uses–that’s 100% normal and usually attributed to the tea. You can continue to use the mama SCOBY as long as you’d like, she doesn’t expire. I’m making my own scopy. My question is can I use the liquid I’m making my scopy in as the 1/2-1 cup of kombochi for the actual real batch of kombochi? Hey Vivian, Yes, I believe you can do that :). Thank you for sharing, Jamie! I’ll look for Olivia’s Special Teas–sounds amazing!! The local company in St. Pete is called Mother Kombucha. I purchase a growler every week from our local health food store full of Mother Kombucha’s latest flavor creation. 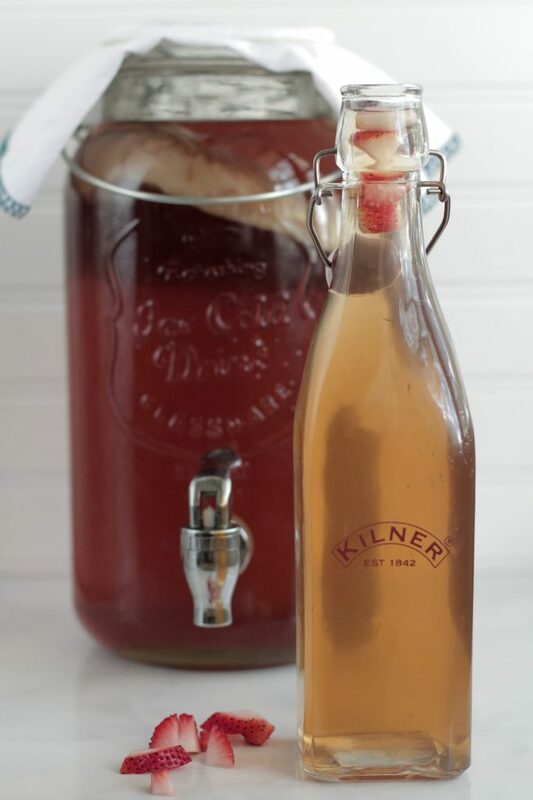 Hi Kristin, I would like to know where to keep the jar containing the Scoby with one cup of Kombucha? In the fridge or on the counter at room temperature? And for how long can I keep it if I don’t want to make a new batch right a way? Thank you. Hey Moca, Generally it’s recommended that SCOBYs and the kombucha are stored at room temperature in a “hotel” (I personally store mine in the fridge due to issues in Florida with bugs/fruit flies). Here’s more information about this subject: https://www.kombuchakamp.com/scoby-hotel-maintenance. Hey Kristin! 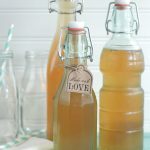 I’ve made your Kombucha recipe several times and love it! However, I made a mistake last batch by forgetting to add Kombucha to the tea/scoby or the first ferment ???? My question is, since the scoby has been sitting in the next batch and it wasn’t fermented (it was so flat) is the SCOBY ruined?? I hope I explained that well enough…. Hey Leanne, I’m not sure. As long as there isn’t any mold growth, I think your SCOBY should be okay. I just ordered my first SCOBY. I read through your instructions saying that the mother SCOBY will never expire. My questions: Do I need to keep the mother and babies fed with sugar whilst in the hotel? What would I need the babies for if the mother never expires? Can I give them away or is it better to keep for future use? What will cause mold? I’m a little nervous to make kombucha but tired of paying for ready-made; I drink a bottle every day. Someone mentioned alcohol and kids. I’m from Europe and children drink fermented drinks, just like eating fermented pickles, etc. all the time. My kids drink store bought kombucha – there is no warning on the bottle and no more alcohol than in homemade pickles, kraut etc. And if parents really are concerned about the minute amount of alcohol they can further dilute the final product with water, juice etc. Finally, I was told to use white sugar before bc it easier for the SCOBY to digest. Do you use organic unbleached sugar? I prefer that bc I already have that in hand but will use whichever is better. Thanks so much for all the info, and your great blog! 1. I’m not the best at keeping a SCOBY hotel, I just reuse my baby and mother over and over, until they get too thick, or pass my babies onto a friend. This is a great resource for building and keeping a SCOBY hotel: https://www.kombuchakamp.com/scoby-hotel-maintenance. 2. Technically, you don’t need the babies, they are just a natural by-product from fermenting the kombucha. You can toss them, compost them, pass them along to a friend, or use a SCOBY hotel to keep them alive if you don’t want to part ways. I think it’s nice to have a back-up just incase anything ever happens to the mother. 3. This is a great, detailed resource about mold and kombucha: http://www.kombuchabrooklyn.com/blog/kombucha-mold-need-know/. You’re going to do great! I can’t wait to hear about your kombucha-making. 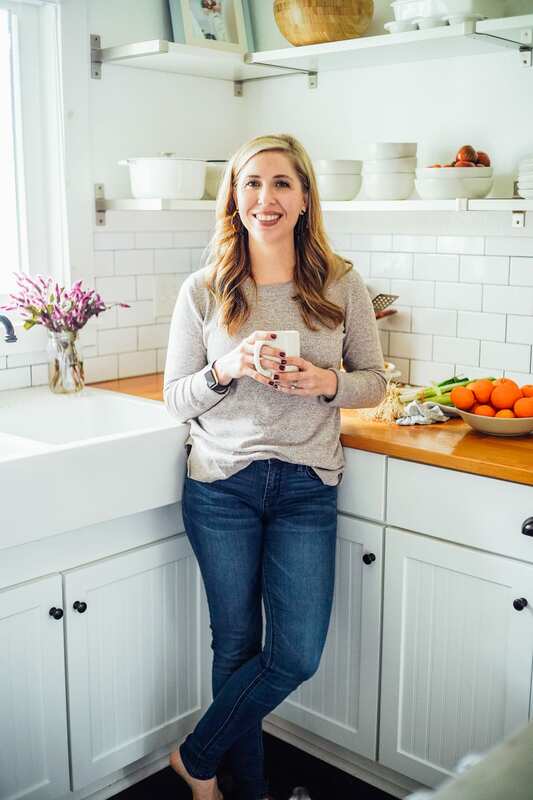 Also, thank you for sharing about the fermented foods and kids–very well said! Hey Lorianne, What kind of bottles are being used? <--Maybe that's the issue? I am finishing my second batch that I made from scratch from the store bought drink. My scoby looks healthy but seems to be pretty thin. Could it be that I didn’t use enough sugar? I used regular white cane sugar, but don’t remember in what ratio. I might try new batch tomorrow following your ratios of sugar water and tea! I am new at making kombucha but I have one batch done and I put it into my bottles and burped the bottles each day but they are not fizzy and it seems as though it starts to grow a Scoby on top of the tea. Am I doing something wrong. I purchased the bottles that you recommend . Hey Kris, This is all completely normal. For the fizz, the kombucha may need to ferment longer during the first ferment. 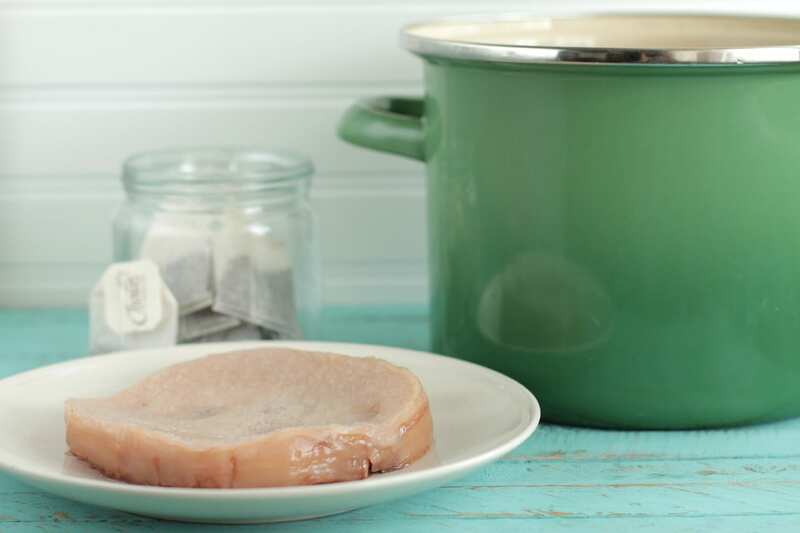 A baby SCOBY will grow on top of the tea each time you make a batch. You can save this baby, toss it, or give it away. Okay. Thank you so much. I’ll try that this time. I have another batch brewing right now. The first batch I fermented for about 2 weeks and then the second ferment was 2 days. Should this be longer as well? I really love your website and all the information that you provide. Hey Kris, Thank you so much. It will vary with the season. When it’s colder out (your home is colder), the kombucha may need to go a bit longer before it’s bubbly and strong. It all depends on your preference. During the summer, the process is much faster due to the warm environment. Thanks for your instructions. I want to try making my own kambucha but the problem I am facing is I cannot find a readymade Kambucha tea in my city. Is there a way to make a scoby from level 0.